The European Geostationary Navigation Overlay Service (EGNOS) has a European regional coverage that could be extended quite easily to areas adjacent to the European Union. 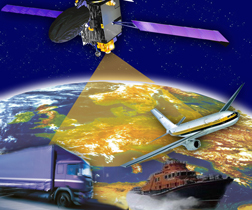 Backed by the European Commission, a public/private consortium is operating programs of technical assistance to prepare nations in the Mediterranean region to adopt and exploit European GNSS services in their priority market segments, namely aviation and road freight transport/logistics. This article describes the evolution of the EGNOS system to date and two live demonstrations of EGNOS applications in these countries: precision landings in Tunisia, and tracking/tracing intermodal containers and heavy goods vehicles in Jordan. These demonstrations respectively represent the first complete experience of EGNOS use for aviation approaches outside Europe and the first real experience of land transportation applications of EGNOS services in far-flung neighbouring regions. EGNOS is Europe’s first venture into satellite navigation and paves the way for Galileo, Europe’s independent GNSS currently being deployed. EGNOS broadcasts a signal that complies with the international SBAS interoperability standards: MOPS (Minimum Operational Performance Standards) established by the Radio Technical Commission for Aeronautics (RTCA) and SARPs (Standard And Recommended Practices) established by the International Civil Aviation Organization (ICAO). Today other SBASs include the U.S. Wide Area Augmentation System (WAAS), the Japanese Multi-functional Satellite Augmentation System (MSAS), India’s GPS Aided Geo Augmented Navigation (GAGAN) system, and the Russian System for Differential Correction and Monitoring (SDCM). EGNOS is interoperable with these other equivalent regional systems, and in the future, it will also augment Galileo. Today EGNOS is operational and has been available for use in aviation since 2011, providing opportunities for users also in non-aviation domains to have more accurate and reliable positioning information with which to enhance existing applications and develop new ones, particularly for safety-critical purposes. EGNOS Open Service (OS), launched in 2009, is delivered free of charge for use by anyone with an EGNOS-enabled or SBAS-compatible receiver. Being based on GPS frequencies and complementary signal design, the EGNOS signal does not require major changes for receivers. Today, many mass-market receivers available on the market are also EGNOS-enabled. EGNOS OS is particularly suitable for mass market and some applications such as precision farming and surveying. EGNOS Safety-of-Life Service (SoL) is authorized for European civil aviation and delivers the integrity message verifying the usability of the GPS system and providing timely warnings (within six seconds) when the system or its data should not be used for navigation. EGNOS Data Access Service (EDAS) launched in 2012, delivers a terrestrial commercial data service that is particularly suitable for professionals. It consists of a server that gets data directly from the EGNOS system and disseminates it via terrestrial networks in real time, with a guaranteed maximum delay, security, and performance. Software solutions connect to EDAS and use its provided data to implement products and value-added services built on it. For example, service providers can deliver EGNOS data via different telecommunication means, augment EGNOS OS performances to improve its availability and GPS position accuracy, or qualify and guarantee the GPS position information by exploiting EGNOS’s integrity feature. The EGNOS infrastructure consists of three geostationary satellites over Europe and ground facilities that include a network of ranging and integrity monitoring stations (RIMS) at the locations shown in Figure 1 (see photo at the top of this article), four mission control centers (MCCs), six navigation land Earth stations (NLESs), and the EGNOS Wide Area Network (EWAN), which provides the communication links for all these elements. Figures 2 and 3 show, respectively, the current coverage of the EGNOS OS and the availability commitment to support approach procedures with vertical guidance (APV-I) provided by the EGNOS SoL service based on this infrastructure. EGNOS and Galileo can provide benefits not only to European Union (EU) member-states but also non- EU countries, as outlined by EU GNSS Regulation 1285 approved at the end of 2013. EGNOS regional coverage could be quite easily extended to areas adjacent to the EU by deploying limited additional elements of the ground infrastructure while sharing the same existing space segment and leveraging the core ground infrastructure. The flexible network geometry of EGNOS RIMS can be gradually adapted to evolving requirements for service coverage. In fact, the coverage of the RIMS network is being expanded over Europe’s neighboring areas beyond that originally envisaged over EU member states, thus increasing the number of beneficiary countries in southern Europe, North Africa, and part of the Middle East. assist the countries to achieve optimal use and adoption of EGNOS services and preparing them for Galileo. This is being deployed through two sequential projects, first with Euromed GNSS I/MEdi-Terranean Introduction of GNSS Services (METIS) and presently with Euromed GNSS II/MEDiterranean follow-Up for EGNOS Adoption (MEDUSA). Running from mid 2006 up to the end of 2009, METIS acted as a pioneer in the Euromed countries and built national/regional liaisons with decision-makers and key stakeholders interested in sharing experience and absorbing know-how. The project assisted the 10 Euromed countries to identify their priorities in the use of EGNOS services, to validate the relevant opportunities from the strategic/social and economic perspectives, and to elaborate a suitable strategy and a plan of actions for facilitating EGNOS adoption and exploitation. Through METIS, the Euromed countries gathered valuable information on the technical aspects of the services and calculated the social and economic benefits that the use of EGNOS (and Galileo in the future) will generate in various domains. Euromed members also had the opportunity to help sketch out the industrial and regulatory issues needed to define a roadmap for introducing EGNOS in the context of subsequent availability of Galileo service. The results of the METIS cost/benefit analysis showed that the Euromed countries present very favorable conditions to reap benefits from the exploitation of the EGNOS services, primarily in aviation and freight transport/logistics/professional road sectors. Built on METIS’s outcomes, MEDUSA — which began in mid-2012 and continues to the end of 2015 — runs a program of technical assistance actions in these priority market segments in the Euromed countries in order to prepare them for an optimal adoption and exploitation of European GNSS (E-GNSS) services, and to assist in the actual service introduction. Like METIS, MEDUSA is led by Telespazio (Italy) and involves a team composed of EU and Euromed partners. MEDUSA technical assistance actions address local needs, fit the countries’ maturity in terms of market readiness and EGNOS service availability, share best practices, support know-how transfer and capacity building, and eventually help the Euromed countries to establish a basis for proper decision-making in implementing E-GNSS applications. Through these activities, MEDUSA aims to prepare some of the Euromed countries (particularly the North African countries where the EGNOS SoL coverage is or will be available in the near future) for adoption and use of EGNOS today and Galileo in the near future. MEDUSA also sets up a long-term cooperation and operation structure named GEMCO (Galileo EuroMed Cooperation Office), acting as a point of reference for all Euromed countries in to E-GNSS. Through GEMCO, MEDUSA catalyzes and fosters initiatives related to E-GNSS in the Euromed region and contributes to the implementation of the assistance actions put in place by the project. MEDUSA is providing a capacity-building package for GEMCO, combining shadow management and technological transfer activities to achieve an autonomous, operational entity after the completion of MEDUSA (that is, leaving a structure behind capable of acting independently). As part of the technical assistance actions program, MEDUSA has implemented two live demonstrations of EGNOS services for applications in the priority market segments: EGNOS SoL service in aviation in Tunisia, and EGNOS OS and EDAS in road freight transport/logistics in Jordan. These two concrete cases represent practical and realistic examples for validating the added value and advantages achievable thanks to the use of EGNOS services. On one hand they benefit other non-EU countries in terms of best practices and lessons learnt, developing methodology and guidelines for possible introduction to other non-European countries interested to exploiting EGNOS services. On the other hand, they have generated a snowball effect by stimulating the interest of other countries of the Euromed region as well as other non-EU countries. The EGNOS SoL application in aviation consisted of validating GNSS-aided aircraft approaches to airports, including Localizer Performance with Vertical guidance (LPV) approaches. These approaches were designed and constructed in MEDUSA along with the relevant safety assessment and business case for the airport of Monastir in Tunisia (located at 35°45’29’’ N 10°45’17’’ E). The selection of the airport was driven by a trade-off between the EGNOS service availability with required APV-I performance and the specific needs of the Tunisian air navigation service provider (ANSP), OACA, Office de l’Aviation Civile et des Aéroports. According to OACA, Monastir is among the airports in Tunisia presenting favorable conditions in terms of operational constraints and traffic for concretely demonstrating the added value of EGNOS for final approaches. The airport has two runways, Runway RWY 07 and RWY 25. The former is equipped with an instrument landing system, Category I (ILS CAT-I); the latter only supports non-precision approaches (NPAs). The possibility of installing an ILS in RWY 25 had been discarded due to technical constraints. ILS infra-structure has proven to be insufficient to cover fully the needs of airports that suffer delays-diversions-cancellations (DDCs) due to local meteorological conditions — in the case of Monastir, frequent fog banks entering from the sea in the early morning, combined with desert haze. These conditions make LPV ideal procedures, as backups to RWY 07 and to enable APV approaches to RWY 25. Finally, Monastir’s TWR ATC (tower air traffic control) staff has been involved in OACA’s performance-based navigation (PBN) development, making them excellent candidates to evaluate the potential benefits achievable from the use of EGNOS. MEDUSA’s technical assistance at Monastir airport was the first complete experience of the use of EGNOS SoL service outside Europe, conceived as a realistic exercise of implementing required navigation performance (RNP) approach (APCH) procedures. The exercise followed the ICAO guidelines in “EUR RNP APCH Guidance Material (EUR Doc 025)” and included all the activities required to meet them. These ranged from a “scenario adequacy” study to flight validation to a requirements analysis for the final presentation in an official document known as an aeronautical information publication (AIP). OACA was directly involved in all activities, providing inputs and feedback as well as for training purposes. Preparations included producing a set of three GNSS-based approach procedures for each runway, following ICAO procedures for air navigation services – aircraft operations (8168 PANS OPS) design principles. The elaborated combined charts of the approaches include minima boxes for three RNP approaches: (lateral navigation or LNAV, LNAV/VNAV (vertical navigation) and localizer performance with vertical guidance (LPV). The GNSS approach procedures preserved the current Monastir arrivals structure, follow-ing airspace management principles and facilitating operational approval. Figures 4 and 5, respectively, show the EGNOS APV-I availability and continuity measured averaged over a 24-hour period during the flight validation campaign conducted from January 30 to February 1, 2014. The left-hand panels in these figures show the general coverage area of EGNOS and the right-hand panels, a close-up of results from the Monastir airport. EGNOS APV-I availability is defined as the percentage of epochs in a given period in which the Protection Level are below the alert limits for this APV-I service (HPL<40m and VPL<50m) over the total period. EGNOS APV-I continuity risk results from dividing the total number of single continuity breaks using a sliding window of 15 seconds by the number of samples with a valid and available precision approach navigation solution. A single continuity break occurs if the system is available at one epoch and becomes unavailable for the following 15 seconds. APV-I availability was more than 99 percent. APV-I continuity risk presented a total value lower than 5×10-4/15 seconds. 95th percentile of horizontal APV-I accuracy was between 1.1 and 1.2 meters and the 95th percentile of vertical APV-I accuracy is around 1.4 meters, thus showing a very good performance. Horizontal and vertical safety indices were lower than 0.25, representing a very good integrity margin. The results of the on-site GNSS performance monitoring campaign showed quite stable performances with small fluctuations during the whole period of observation. No EGNOS outages or other problems were observed. Moreover, the calculated obstacle clearance height values for both runways and the minima of the three approach categories improved with respect to the existing conventional approaches, providing sig-nificant operational and safety benefits. The flight validation campaign was carried out according to ICAO Document 9906 using a Piaggio P180 Avanti II (from ENAV’s flight inspection department) suitably equipped with a flight inspection system and a flight management system (FMS) with SBAS LPV approach capabilities. The outcomes of this concrete experience have allowed the Tunisian authorities to identify the main elements for the publication of the validated procedures in their national AIP. They have also contributed to the analysis of the necessary process for the operational adoption of GNSS, including EGNOS, in aviation in countries beyond the EU boundaries. Following on the experience of Tunisia, MEDUSA has undertaken two further assistance actions related to aviation uses of EGNOS. Finally, MEDUSA organized an advanced course on designing GNSS approach procedures held in Morocco. Hosted by the Ministry of Transport of Morocco under the auspices of the Morocco Civil Aviation Authority, the course was opened to the procedure design staff of all Euromed countries. For almost all the Euromed countries, road freight transport and logistics have been identified as priorities where the associated markets are becoming ever more mature. Today, the adoption of GPS technology is growing quickly for such commercial applications as tracking/tracing vehicles that transport goods (for safety and surveillance purposes) and for monitoring service fleets. As part of its technical assistance program, MEDUSA carried out a live demonstration in Jordan to validate the use of E-GNSS, and specifically of EGNOS, for tracking containers shipped across the Mediterranean Sea and vehicles transporting goods in Jordan. The live demonstration was conducted with the involvement of the Jordan customs agency and with the aid of the Ministry of Transport of Jordan. The results and lessons learnt can be useful for the Euromed countries to elaborate guidelines and recommen-dations for guiding the operational introduction and adoption of satellite navigation services, possibly including EGNOS and eventually Galileo. the collection of data for statistical reporting and incident prevention. These benefits have been long available in commercial fleet management, where such capabilities became part of a pervasive “quality control” system for the shipping industry (e.g., temperature, route optimization, driver performance, maintenance planning, and so on). In Jordan the use of real-time tracking technology in logistics and freight transport is not only a matter of efficiency but also a means for ensuring safety and security along the goods’ supply chain. Tracking/ tracing solutions based on GPS and radio frequency IDentification (RFID) technologies have been widely adopted by Jordanian customs officials for monitoring the movement of freights and heavy goods vehicles across the country. From a geographical perspective, the strategic location of Jordan makes it the center for movement of goods between Europe, Africa, and the Arabian Gulf region. From an economic view, transit is a strategic market for the country, with more than one million trucks crossing Jordan yearly, according to Jordan Customs. From a security concern, trucks transiting Jordan are considered at high risk of being used to smuggle goods and dangerous materials. The dense and irregular flow of trucks from neighboring countries has led to increased traffic jams at customs houses. Some trucks are delayed for many hours, often having to stay overnight at border customs facilities. The traditional customs escorting process (convoys) causes traffic jams on highways, disturbs the smooth movements of passenger cars, and delays the movement of goods across the country. The country’s maturity and strategy for the freight transport sector promote the use of advanced technologies as efficient solutions to facilitate trade. Jordan customs have already adopted an intelligent transportation system (ITS) based on GPS to manage and monitor transiting freight. For the foregoing reasons, Jordan provides an excellent and concrete scenario to show the added value that EGNOS can provide with respect to GPS. 1) A maritime case, in which containers, equipped with tracking devices, are tracked and traced during their shipment from Europe to Jordan through the Mediterranean Sea. Specifically, some containers were shipped from the port of Ravenna in Italy via sea to the port of Aqaba, Jordan, and others from Brescia, Italy, by rail to the port of Genoa and then via sea to the port of Aqaba. 2) A mainland case, in which the containers, are transported from Aqaba across the Jordan territory via road. a tracking device installed on the container and able to provide the relevant position by means of GPS+EGNOS. The tracking device integrates a GPS/EGNOS chipset and is configured to use EGNOS OS and EDAS. Detailed information about the characteristics of the device and how it can be mounted on a container is given and shown below. a software solution named LCS (LoCation Server). LCS enables the tracking/tracing system to use EDAS and to provide value-added services by exploiting the relevant features of EGNOS (i.e., corrections and integrity information). We will provide more detailed information about LCS later. a monitoring and localization platform, which enables tracking/tracing, statistical analysis, and alarm management functions via Internet access. The tracking device is shown in an accompanying photo with its key specifications listed in Table 1. It integrates a GPS/EGNOS chipset that can use EGNOS OS and EDAS by means of LCS. The device’s design and dimensions are driven by the need to cope with stringent requirements and the harsh operating conditions posed by the transhipment of freight through different environments (inland and overseas) and being unpowered for long periods of time. For this reason, the unit is enclosed in a waterproof package that also provides robust protection against dust. Further, the enclosure’s dimensions allow it to be mounted in the grooves of intermodal containers’ sidewalls. The tracking device can be installed and removed by means of strong magnets to avoid the need for screws and holes to attach the unit. Long-life rechargeable batteries support up to six months of operation without maintenance, accommodating the absence of any external power source in containers during long-distance hauls. The batteries can be recharged by plugging the tracking device into a standard electrical outlet. The tracking device can periodically send information on its position, with the transmission rate able to be remotely programmed. The device also integrates motion sensors, so that a more frequent position update rate is automatically set when the container is stopped (e.g., in ports or intermodal terminals). Otherwise, one position report per day is sent when the container is in motion (indicating, for example, that the container is on a vessel). To ensure a robust datalink, the tracking device transmits positions via terrestrial GSM-GPRS network but switches to satellite INMARSAT communications when the terrestrial network is unavailable. Data transmission has been optimized for cost-effectiveness and reduced power consumption. LCS is a “plug-in” navigation solution with which existing GPS systems can be easily retrofitted to use EDAS and provide value-added positioning services. As shown schematically in Figure 6, LCS consists of software modules running on a server connected to the tracking/tracing system and to EDAS. LCS obtains data and corrections from EDAS and the data from the tracking devices installed on the assets being tracked (e.g., vehicles, containers, tankers, wagons, trucks). The added value of EGNOS data distributed by EDAS arises not only from obtaining position fixes that are more accurate than standalone GPS but also from metrics that qualify a measured position. The so-called “protection level” (which is a customization for land applications of the aviation Protection Level concept) expresses the system’s “confidence” in the reliability of a position. In other words, if a “protection level” is provided, the position is qualified within a certain level depending on the value of the “protection level” itself. In addition to remote localization, tracking, and tracing, a Web-based application performs such functions as alarming, reporting, geofencing, and so forth. EDAS-augmented position information accessed through LCS consists of latitude and longitude (as for a GPS-only position, but more accurate), time of the measured position, and the “protection level.” Figure 7 presents a screenshots of the Web-based application during the live demonstration in Jordan, showing that EDAS is used: EGNOS corrections are applied to the position and the “protection level” in the horizontal dimension (HPL – horizontal protection level) to provide the user with a higher confidence in a container’s reported position. The screenshot in Figure 8 reflects a condition in which only standalone GPS is used without the benefit of EDAS. EGNOS corrections are not applied to the position, making it impossible to calculate a “protection level”; thus, a value is not given for the HPL. In the live demonstration carried out in MEDUSA, Jordanian customs personnel monitored the movement of the containers in real-time by accessing the Web-based application and had an opportunity to appreciate the system’s potential benefits in terms of security and expedited freight traffic flows. Thanks to the integrity and improved accuracy available through EGNOS, tracking/tracing systems can also be a useful tool for enforcement and compilation of reliable statistics. The live demonstrations launched in March 2014 are still running and could evolve into an operational best practice for Jordan Customs. In parallel with the confirmation of EGNOS’s added value from the operational perspective, MEDUSA has also undertaken an analysis aimed at evaluating the performance of EGNOS in terms of technical indicators. Table 2 presents the results of a comparison between the precision of the positions obtained by four tracking devices installed in various locations (under similar GNSS environmental conditions), in the cases of GPS-only and GPS corrected with EDAS using LCS. The table reports the values (in meters) of the horizontal and vertical distance root-mean-square (DRMS), being the root mean square of the distances (projected on the horizontal plane and vertical dimension respectively) from the average 3D position to the observed positions obtained from a number of trials. The values show that LCS improves the position. Figures 9 and 10 show the availability of the “protection level” in the horizontal dimension and the relevant statistical distribution, for the positions of containers in Jordan and in Europe (Italy and France). As expected, these plots show an EGNOS performance degradation in Jordan with respect to Europe. For Jordan, the availability of an HPL is about 25 percent, and in most of the cases the HPL’s values are between 12 and 14 meters. On numerous occasions the HPL’s values are even higher. At the Europe locations, the availability of HPL is about 78 percent, and in most cases the HPL values are between 8 and 10 meters. Of course, as long as EGNOS service coverage will be extended into the Euromed countries, the situation in Jordan will improve and produce similar results as in Europe. This MEDUSA Jordan live demonstration proves that EGNOS OS and EDAS services are ready for use, although with degraded performance, far beyond the European borders. In this respect, the results of the MEDUSA experience in Jordan are useful not only for the Euromed region, but also as valuable examples for other countries outside Europe interested in using EGNOS in freight and road transport applications. Through its achievements, MEDUSA is confirming that EGNOS and Galileo can provide benefits not only to European countries. EGNOS can deliver added-value services to the Euromed region, just by leveraging the existing European infrastructure with only incremental, marginal, and natural extensions. Furthermore, MEDUSA is paving the way for the introduction of EGNOS services in North Africa and Middle-East region and is also defining a suitable path available to other interested non-European countries. MEDUSA clearly shows that Euromed region, presently lacking the full support of SBAS technologies, represents an opportunity for EGNOS service extension, with many benefits for the countries of the region and for Europe. Overall, MEDUSA is continuing to confirm the ability to foster cooperation and involvement in EGNOS program of the great majority of the Euromed countries. In the wake of the Tunisia aviation trials, other Euromed countries have already expressed their interest in using EGNOS in aviation, considering their own national strategies as well as a common, shared regional perspective. MEDUSA’s live demonstrations, understood as proofs of concept, can be considered as “case studies” to stimulate and to trigger the development of national and regional initiatives in the form of research projects, adoption of new technology, and development of transport policies that include E-GNSS services as core enablers to achieve their goals. Projects like MEDUSA provide opportunities for Euromed countries to share the European experience and gain advice and guidance for implementing their own activities. Euromed transport authorities could benefit from launching projects similar to those presented in this article on a national or, even better, on a regional basis to take full advantage of the early services offered by EGNOS today. As a result of such efforts, positive feedback has emerged from Euromed countries along with a clear interest in pursuing initiatives to work with European players, to absorb know-how, and to concretely implement EGNOS in their region.